For those of you who have never heard or seen this word before (although I don’t think there’s many) I feel a definition is appropriate. Now yes, the argument can be made that this topic has nothing to do with food … you are right. However, it is a wide variety of stuff I made in my studio this week … so, yes, the definition (by definition) fits! 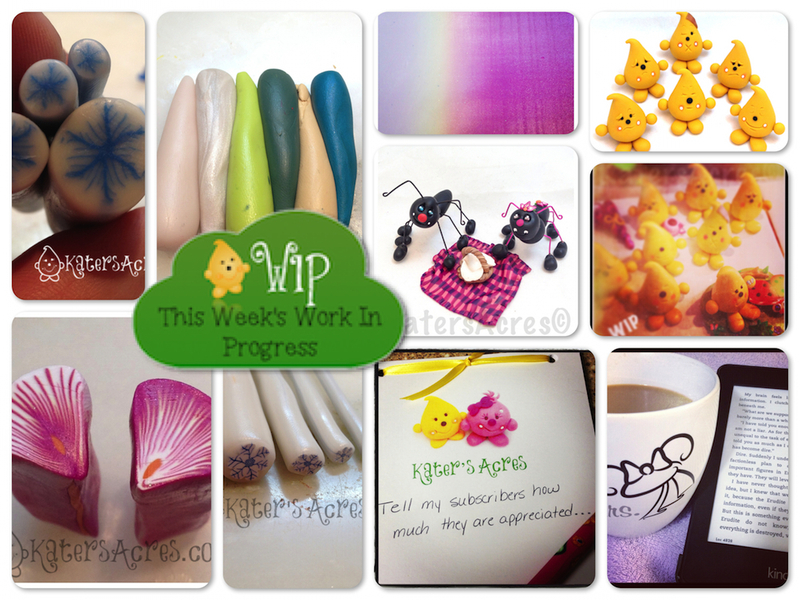 For those of you who are new to my blog, WIP means “Work In Progress” and every Wednesday I show you what’s been going on in my studio and provide any relevant links you might need. I go through the graphic featured above (and below) clockwise from top left. I made these “leaf cane” like Snowflake Canes for the 52 Weeks of Canes Group. I will post all about them on Friday. This next teardrop blend is a preview of a tutorial that’s coming to you next week. Remember, tutorials run on Tuesdays, so don’t miss out, follow me on your Feedly account! Dear Skinner Blend … Oh how I love thee! I really love making skinner blends and because I hand-blend 90% of my clay, I never duplicate colors or patterns. This week I shared with you how to make a Skinner Blend Plug here. EMOTICON Parker’s set two, all ready for their new home. And just underneath, EMOTICON Parkers being made! This set has already been adopted. The third set will be available for purchase the 4th week in June. Or contact me here to order your own six piece set of EMOTICON Parker’s. My downtime … After an emotionally exhausting several weeks, it has felt really good to take a break in the evening with a cup of decaf coffee and my Kindle. Yes, I read a lot and I have read 100 times more since owning a Kindle. I have the Paperwhite and I LOVE it! AH! Well kookie there … a note for my subscribers! From me to you, thank you for supporting me in my endeavors to share my passion of polymer clay with the world! ANTS! There are ants everywhere. Learn how to make these cute & fun Ants by becoming a member of Parker’s Clayful Tutorial Club anytime this month. Your first month subscription is just $5.00! Yes, I do miss winter, but that’s not why I’m making snowflake canes. I’m making snowflake canes as part of our 52 Weeks of Canes project for the week. More details on these coming on Friday. Last, but not least, learn how to create your own set of 2 petal canes from ONE Skinner Blend. This tutorial was requested by YOU, my readers. This past week I did some large artwork … not in polymer, but from wood! I made shadow bears to put at the edge of my woods so that when I sit on “Bear Junction” I can look at some cute bears. 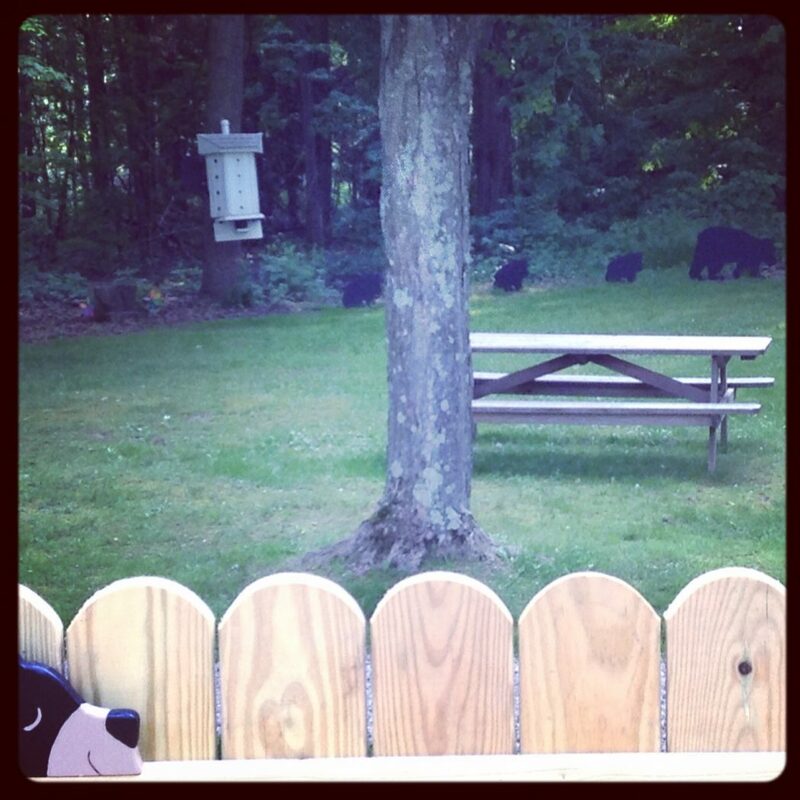 See those things that look like black “dots” by the woods … they are bears. One Mama Bear and four little baby bears. Yep … they are cute! I have found myself addicted to a new TV show I had never seen before, “Once Upon a Time” and I have watched about 9 episodes this week … that’s a HUGE amount of TV for me. But I really like this show. For me finding a good TV show is rare … I’m too picky. I like fantasy with a bit of sci-fi mixed in … this seems to satisfy that craving. Do you know of any shows I might like? Keep in mind we do not have traditional TV or Cable and ONLY have Netflix. God is opening oodles of doors for me and I’m afraid I have to close some, which is hard for me. Learning how to say “no” is important, but the decision is never easy. I still haven’t seen Maleficent … maybe I’ll get there this weekend? What’s going on in your studio? What are you working on? Is there a project you’d like to see me tackle and feature on the blog? Let me know in the comments below. I’d love to hear your thoughts & ideas! Feel free to also leave a LINK to work you did this week. Don’t be shy … just do it!